The horror film and the war film seem like a natural match for one another. I don’t see the combination as often as I think I would. Some of it probably has to do with political and personal nature of many wars. Where action films can re-imagine war and turn it into wish fulfillment, horror films are often much more pessimistic and usually center more on confronting darkness. I think when used correctly, the starkness and unknown forces that often lurk in armed conflict can be exaggerated and used to comment on what war does to people. During the Angolan Civil war, a squad of soldiers is wiped out by a local tribe. A South African commander sends in a detachment of soldiers (A Stick) to find out who is responsible and eliminate them. The men are not thrilled about crossing border with orders to kill, but they reluctantly head out to their mission. On route they kill some children both deliberately and accidentally. They arrive at an isolated village and confront a defiant witch doctor. They kill him and wipe out the village, on their way back to base the men start getting picked off one by one as something stalks them. 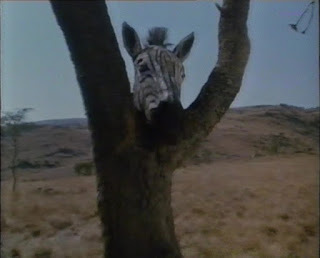 Coming soon from Dreamworks Entertainment, "The Zebra Tree." 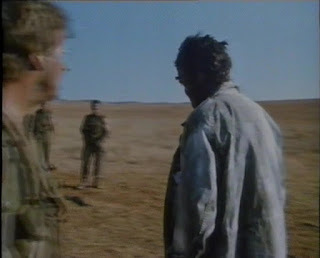 The Stick possesses a bleakness that is reflected in the barren looking grasslands where most of the film takes place. It is primarily a war film, with the supernatural elements only creeping around the edges until late in the story when they become more overt. There is a naturalism present that renders the violence that much more potent and lets the horror mirror the worsening mental health of the soldiers. It may have just been the low resolution VHS version I was watching, but there is a blown out look to everything. You can just feel the heat and discomfort. "Looks like some silly goose forgot his sunscreen." The plot of The Stick is nothing special, it follows traditional horror tropes in many ways. Transgressors are punished for their crimes, often in ways that are ironic or mysterious. Since the main character narrates the story the whole way through there is little doubt who the survivor is going to be. None of these elements are enough to ruin the film, The Stick lives on its atmosphere and a more complex story might have detracted from that. Still, some of the characterizations are a little clichéd, the commanding officer is an indecisive mess, the native soldier is superstitious, and the crazy violent soldier is already a ten on the crazy-o-meter when the film starts. Banned in South Africa for four years, The Stick is a brutal war movie that does not shy away from showing atrocities that can happen during combat. It is also a haunting ghost story that is thick with a doom-laden atmosphere. The South African setting adds a unique touch to what is already an engaging film. 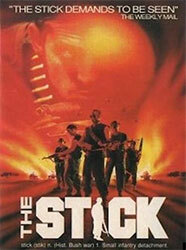 The Stick is how to do a horror-war film correctly and it is well worth tracking down.